Foth Folder – John's Cameras. My criterion for buying my old cameras is that they must interest me. I prefer them to be in working condition but it is not essential. In good cosmetic condition is nice but so is ‘well loved’. In this case, ‘Interesting’ is the maker – Foth. Previously, I knew of Foth from the Foth Derby camera which has a very high reputation (yet I do not own one!). This Foth folder dates from the very early 1930s as far as I can ascertain. In many ways it is the same as many folding cameras made by many makers around the world. Dating is hard as there are no serial numbers anywhere. Many features – iconometer for viewfinder, presence of a Brilliant finder, dial-set shutter, slide focusing rather than helical focusing – point to pre-1930 (although pre-1930 can extend into the mid-1930s). Even with those features, the detail of the iconometer suggest earlier rather than later – the eye-piece is a pointer rather than a frame. Yet, the Interweb tells me that having two knobs to extend the bellows means post-1930 on Foth cameras and the presence of the iconometer means post 1931. So, if I am to believe the Interweb, Foth were selling a very old-fashioned camera in the 1930s. I have no evidence on the camera to be able to form my own opinion here. Dating is hard as there are no serial numbers anywhere. The maximum aperture of f/4.5 also suggests a later date but the aperture scale – 4.5, 6.3, 9, 12.5, 18, 25, 36 – suggests an earlier date. I am not sure when the scale used here finally disappeared but my other cameras of this sort of date seem to have changed over to the modern scale around 1930 – the actual dates vary from maker to maker (Zeiss early 1900s, Voigtlander at the very end of the 1930s, Leitz in the early 1940s). All in all, I think I can safely say that this camera was made before 1940 and probably 1931 to 1935. The rear of the camera has the initials ‘H.E.F.’ stencilled in white on a scroll background – this will be either the retailer or the owner. The name ‘Foth’ only appears once on the camera. It is embedded in the leatherette on the baseboard/lens door. There is no model name or reference number anywhere. I assume this means that Foth only made the one folding camera model. The rear of the camera has the initials ‘H.E.F.’ stencilled in white on a scroll background – this will be either the retailer or the owner. I tend to think it is the initials of the owner as retailers usually rely on stickers on the inside. While the camera is closed, there are few controls apparent. On one long edge are the film advance key at one end, the viewfinder eyepiece/pointer in the middle and the baseboard/lens door release button near the other end. On the other long edge, at the end, is the tripod socket which is the 3/8 inch version. Near the middle is a sliding button to release the back for film loading. This part is very like a Braun Paxette – the back, the base and part of the front on both sides come away in one piece. On the back is only the red window for advancing the film. On the front of the camera is the hinged baseboard/lens door. While closed, this has a folding foot to enable the camera to sit upright on a level surface. Near the hinge is a second tripod socket. Again, this is a 3/8 inch thread. The whole camera os covered with a thick, cardboard based, leatherette. This has been very damp at some point and the cardboard backing has seriously buckled. The leatherette on the hinged baseboard has the legend ‘Foth’ embossed on it. Pressing the stud on long side causes the baseboard to spring open. The spring is strong enough to open this all the way without any help. All that is required of the user is to click the baseboard down to finally locate the struts securely. 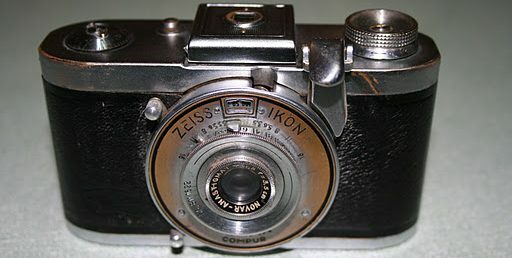 As an older design camera, the shutter/lens assembly does not move and needs to be pulled out by hand – two chromed studs are provided as a hand-hold. Pulling the shutter/lens out to the stop position will leave the lens focused at infinity. To focus nearer, there is a metal slide on the front right-hand side of the baseboard. This has an ivorine scale which extends from infinity to 1.5 metres. Fine focus is not possible but this will not have mattered as the user will only have had contact prints made and focus defects would not have been visible. The shutter is an everset shutter made by Foth. It bears the logo ‘FCFC’ for ‘F.C. Foth Company’. This offers speeds of 1/25, 1/50, 1/100 seconds plus B and T (B keeps the Sutter open for as long as you keep your finger on the shutter release. T opens the shutter which will stay open until you press the shutter release a second time). The lens is a Doppel which is German for double and indicates a two element lens. This will be better than the single meniscus lens used on very cheap cameras but nowhere as good as a triplet as used on cheaper decent cameras or an upmarket Tessar with its four elements. There is a socket for a standard cable release just below the shutter release lever. There is no delay action lever on this camera. There are two viewfinders provided. The first is a small brilliant finder which will only work in good but not bright light. When the camera is folded up this brilliant finder collapses to fit into the tight space available for it in the camera body. I find these finders just about impossible to use. This one is in good condition – usually they are made from steel that has had chromium plated directly onto the steel which is usually too rusted after 50 to 100 years to be usable. The second finder is an iconometer (I think the name ‘Iconometer’ might have been a registered trademark of Zeiss Ikon but I am still going to use it). This consists of a large wire frame attached to the side of the shutter housing. In use, it hinges out to the left. This wire frame measures 60 mm by 90 mm which is the size of the negative. On the camera body is a folding pointer which the user has to centre in the frame. This is not going to be precise but will have been more than good enough for holiday landscapes and beach portraits. in place by a black painted brass strip. This does not hold the spools very securely and I find it necessary to keep a finger on each spool as I refit the back. Might get easier with practice. Previous Demaria-Lapierre Dehel folding camera.